A fun and easy way to view the picturesque northern part of Ibiza. 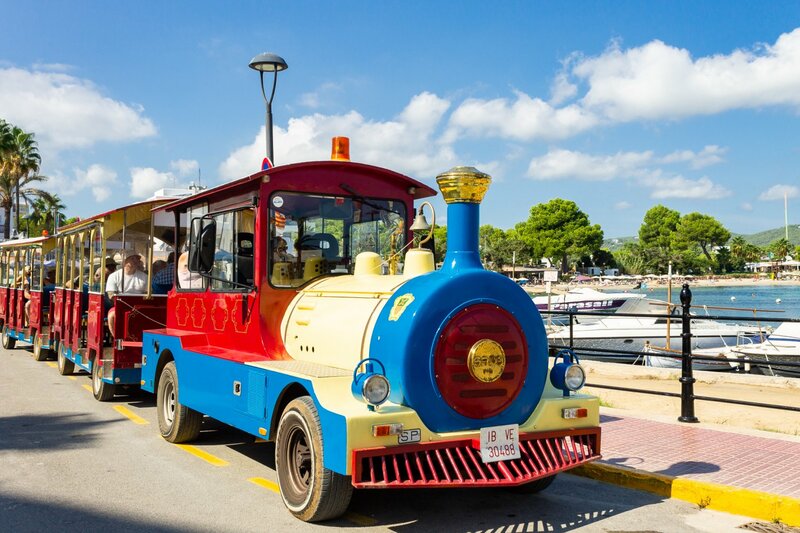 All aboard the Ibiza Tourist Train for a fun-filled trip along the beautiful 'tracks' through the hills, valleys and pinewoods of the island. Enjoy the sunshine, cooling breezes and the scent of rosemary and pine as you see the spectacular scenery with stunning views from on high. Make sure you take your camera! NOTE: There are also charming train tours available departing from Santa Eulalia, Cala LLonga, Es Figueral, Portinatx and San Miguel. Every day at 10:30 the train takes you along country lanes to the wonderful beaches of Es Figueral, Es Pou des Lleó, Cala Boix, past the coast of Cala Mastella with plenty of photo opportunities and a chance to swim at the sandy Cala Leña beach before returning to Es Caná. Every day at 15:30 the train takes you into the real Ibiza countryside, stopping at the picturesque village San Carlos, where you will have time to visit the 18th century church and a typical old farm house from the 17th century. Then the ride continues to a relaxing, quiet beach with a small beach bar. After this stop it is time to head back to Es Caná. Price: Adults 16 euros, children (under 12) 8 euros, up to 3 travel free.